This article is courtesy of Ole Miss Media Relations. COLUMBIA, Mo. 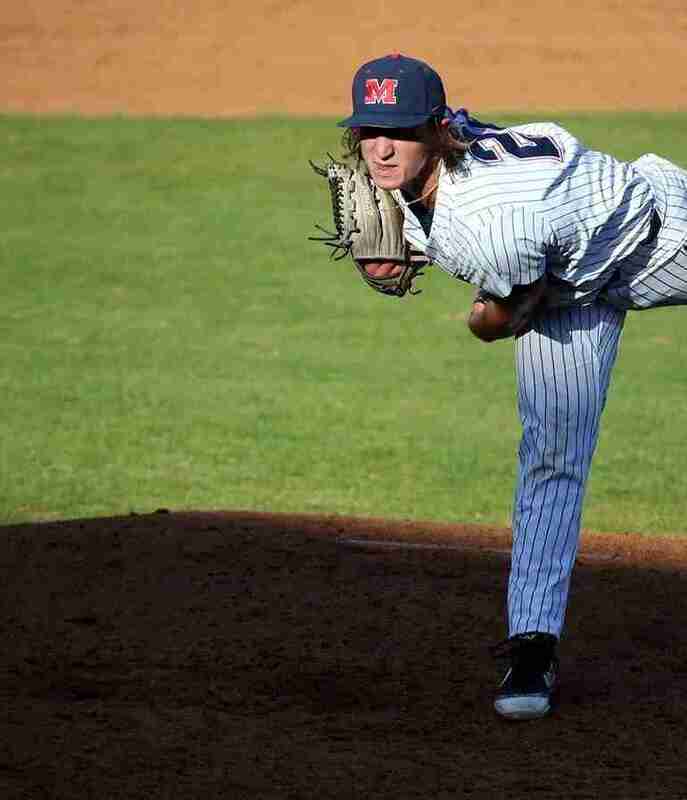 – In his first career weekend start and first Southeastern Conference start, freshman left-hander Doug Nikhazy carried a no-hitter through 6.1 innings as Ole Miss (17-2, 3-2) blanked Missouri 3-0 Saturday afternoon to even the series. Nikhazy (2-2) was marvelous on the mound for the Rebels, silencing the Missouri bats until a rocket off the glove of third baseman Tyler Keenan gave the Tigers their first hit with one out in the seventh inning. He quickly erased that base runner, ending the inning with a 1-6-3 double play on a comebacker. The freshman from Windermere, Florida, kept rolling in the seventh, retiring two more batters before giving up his second hit and giving way to closer Parker Caracci, who was equally dominant, striking out three of the four batters he faced to cap the Rebel victory and earn his fourth save of the season. While Nikhazy and Caracci strung together nine zeroes, the Rebel offense had a solid day against one of the SEC’s top arms in Mizzou’s TJ Sikkema. Ole Miss threatened offensively in the first and second before breaking through in the third. Keenan and Thomas Dillard drew back-to-back walks, setting the stage for Ryan Olenek’s 49th career double, which sent Keenan across for the game’s first run. In the fourth, Cooper Johnson led things off with a single to left field. Knox Loposer followed that up with a nearly identical base hit, but the ball skipped away from Mizzou left fielder Josh Holt Jr. and rolled all the way to the wall, allowing Johnson to score and Loposer to wheel all the way around to third. Tim Elko quickly drove Loposer home on a rocket that was too hot for the Tiger shortstop to handle, making it a 3-0 game. As it turned out, that was more than enough scoring in the Rebel victory. Very few Tigers made their way onto the basepaths in the contest. Nikhazy hit one batter with two down in the first inning but escaped the frame on a ground ball to short. After a one-two-three second, he walked two in the third, but Johnson quickly quelled the Mizzou threat, throwing out a would-be base stealer to end the inning. Nikhazy then mowed down the Tigers in order through the fourth, fifth and sixth innings. He allowed his first hit with one out in the seventh before turning a nifty double play to end the inning. The rookie easily got the first two outs in the seventh before giving up a base hit to left, bringing Caracci out of the bullpen. The redshirt junior out of Jackson, Mississippi, struck out the first batter he faced to escape the jam. Then in the ninth, he sandwiched two strikeouts around a routine groundout to seal the deal on the shutout win. Ole Miss and Missouri will decide the series Sunday at 2 p.m. CT. The game will be nationally broadcast on SEC Network. – Ole Miss improved to 17-7 on the season and 3-2 in SEC play. – Making his first weekend start and first start in SEC play, freshman Doug Nikhazy was outstanding, throwing 6.1 innings of no-hit ball. His final line was a career-high 7.2 innings with no runs allowed on just two hits and two walks, striking out three along the way. – Parker Caracci threw 1.1 flawless innings to earn his fourth save of the season. – Ole Miss nearly had two no-hitters in a four-day span. Zack Phillips, Kaleb Hill, Pierce Smith and Taylor Broadwaycombined on a no-hitter in the Rebels’ 25-0 win over Arkansas-Pine Bluff this past Wednesday. – Freshman Knox Loposer had his first career multi-hit day. He is 3-for-6 with a run scored and two RBI in this series, starting both games in the DH slot. – Cooper Johnson nearly had his third home run of the season in the eighth inning but was robbed of a homer on an outstanding play by Mizzou left fielder Josh Holt Jr.
– Ole Miss recorded its third shutout of the season, its second in SEC play and its second in the last three games.